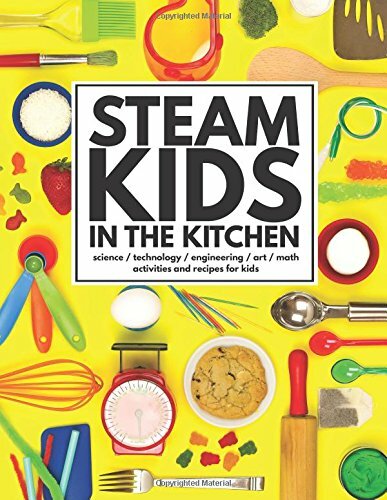 A kitchen full of captivating STEAM (Science, Technology, Engineering, Art & Math) activities that will wow the boredom right out of kids! Packed with a whopping 70+ activities and recipes, this book will get the kids having fun and learning in the kitchen. Ever wonder what makes bread rise, what molecular gastronomy means, or how a solar oven works? You'll find out in this book that teaches and excites with fun hands-on science, technology, engineering, art, and math projects. It's STEM & STEAM made fun! -- And so many more!!! Bonus sections will help kids learn about the amazing science behind the food they eat, the innovators who have changed our world through the kitchen, and fun stuff like kitchen careers and more. If you have any questions about this product by STEAM Kids Books, contact us by completing and submitting the form below. If you are looking for a specif part number, please include it with your message.